At Camp your pups reap the benefits of exercise and socialization while having lots of fun romping & playing with their canine friends. Your pup will "Play all day and snooze the night away. "® Rest assured knowing your camper is well taken care of at all times whether you are gone for a day, over night or for an extended period of time. Your pet is a part of your family and we want them to be a part of ours too. How can my dog go to Camp? Serving Spring, Conroe, The Woodlands area, Oak Ridge North, Shenandoah and surroundings areas. Our Canine day Campers spend all day romping and playing indoors and outdoors with other furry friends and get lots of attention from our well-trained Certified Camp Counselors®. 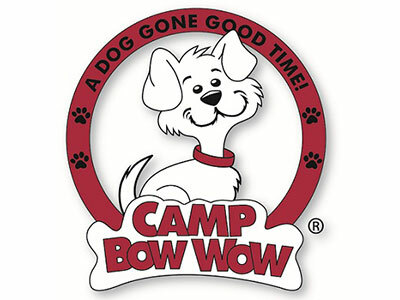 Overnight Campers even get special "campfire" treats each night before lights out, when they are tucked into their own spacious Camp Bow Wow® cabins. Each cabin includes a comfy bed with a fleece blanket to curl up on in a climate controlled atmosphere. Campers from the same household can even stay together in the same cabin. In addition, Camp Web Cam monitoring and professional security systems make sure all our Campers are happy and safe! Home Buddies is the most complete in-home pet service available. From dog walking and pet sitting to poop scooping and a full range of concierge services, Home Buddies is your one-stop shop for in-home pet care. Bow Wow Behavior Buddies is our premier dog training program. Behavior Buddies was created to help you modify your canine player's behavior issues, teach a new puppy the game, or make an already good dog a MVP!